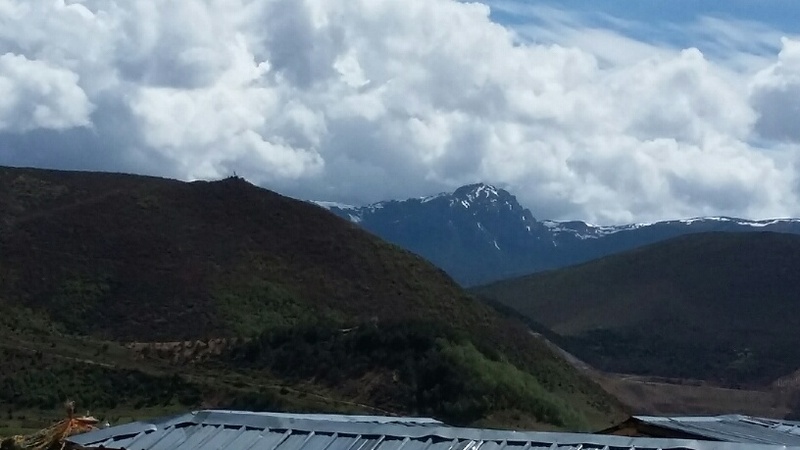 Yesterday, I talked about LiJiang, but Lijiang was only half the trip. Today, we’re going to Shangri- La. Yay!!!! On the map, it looks pretty flat, but It is actually over 3,000 m above sea level. That is some pretty intense altitude It is honestly one of the most beautiful places EVER!!!! 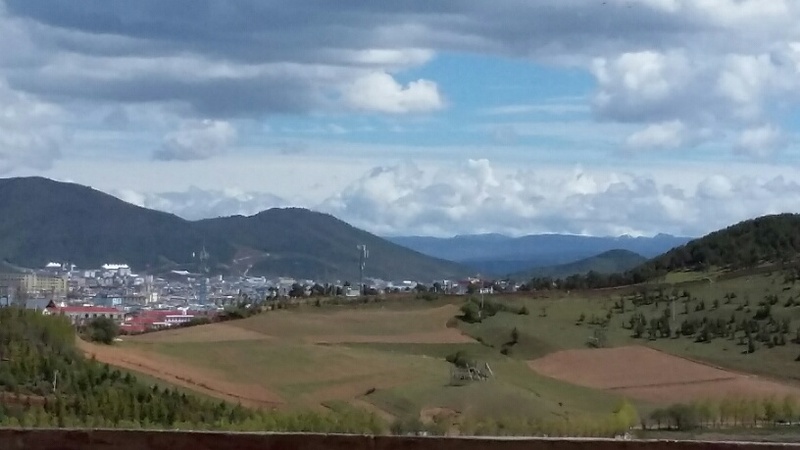 Shangri- La is just on the Tibetan plateau so most locals are Tibetans. The town has a long history but was destroyed by fire and had to be rebuilt. 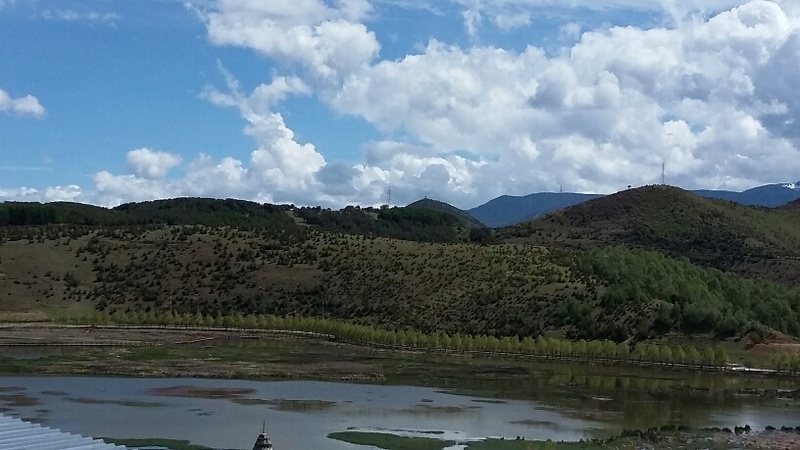 Consequently, it’s not as nice as LiJiang. What sets it apart is its scenery. So what were the highlights? I had honestly never seen bluer skies (The pictures don’t really show this). We also saw plenty of yaks, some wild pigs and at one point, and entire herd of sheep. On a less happy note, the ground was littered with manure so don’t plan on wearing new shoes when hiking here. 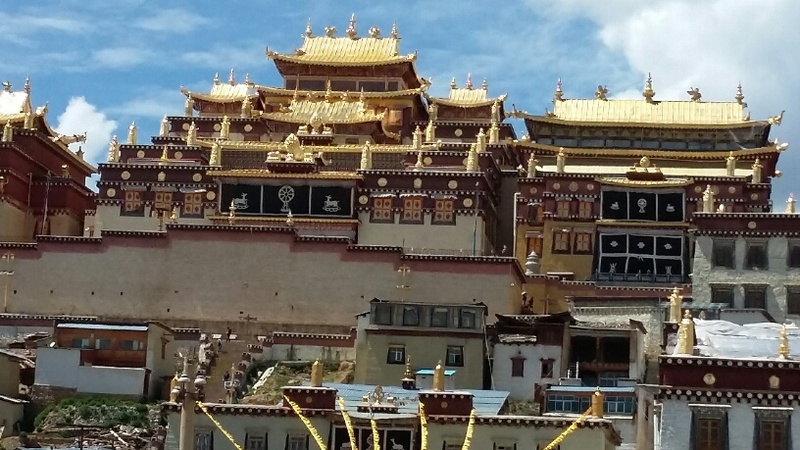 This is the biggest Tibetan Buddhism monastery in Yunnan province. Tibeten Buddhists must require big ones because this one is HUGE. It was originally built in 1679 by the 5th Dali llama and has been rebuilt (Read: expanded) 5-6 times since then. The last time was in 2006. The place consists of the main temple in the center with a study center on the right and more praying space on the left (not pictured). The monks live in the houses below. Everything inside was opulent and amazing. There were guilded, bejeweled buddhas, colorful panitings and bright statues. There was also a peaceful and holy feel to the temple. Unfortunately, there were some disrespectful, loud tour groups. I highly recommend going to the temple, but earlier in the year- around March. It will be colder, but the quiet is worth it. I also suggest hiring a local tour guide, they will provide you with so much more information. After visiting the monastery, we walked five minutes to visit a local family. As the header suggests, they fed us…… a lot. 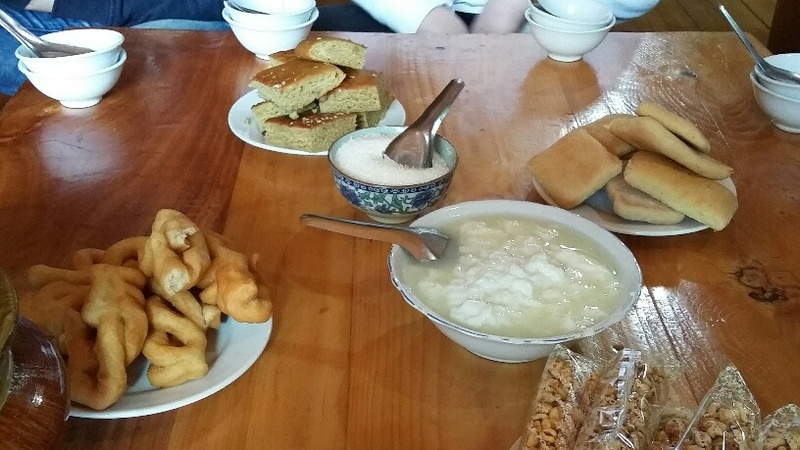 When we arrived, we headed up stairs into the living room and waiting for us was homemade bread, yogurt and other delicacies. 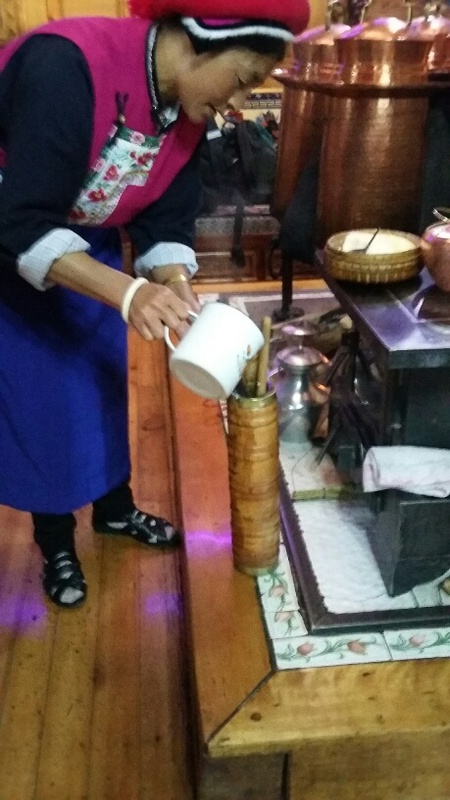 Yak butter tea is just what it sound like, tea mixed with yak butter. For tibetans, it is a must have when welcoming guests. I was skeptical at first, but it was quite good. I found it a bit rich though. With that done, snack time!!!! I tried the breads and they were good, but the yogurt won hands down. It had the taste of fat-free greek yogurt with the texture of soft tofu. It was quite sour, but that’s what the bowl of sugar was for. The family was also really nice to us and the house was beautiful ( they wouldn’t let us take pictures of the house). If possible I highly suggest visiting a family like this. I really wanted to try Yak milk and cheese. I never got my milk but the owner of one of the restaurants gave me some cheese. It tastes like aged sharp cheddar- I liked it but it’s very strong. The yak jerky is DELICIOUS. It’s everywhere, relatively cheap and most stores will let you try some. LiJiang and Shangri-La are famous for their herbs, mushrooms, medicinal plants etc. Don’t buy anything of this type from random street stalls…. it’s either fake or low quality. If you’re into protein, this area is one of the world’s only sources of wild spirulina. It’s cheap, like 128RMB for 3-400 grams. Fresh roasted coffee is SOOOOOO much better than stored beans (don’t even mention instant). There was this store that roasted its beans on the spot and I had a cup. It was magical. Yunnan is the only place in China that produces coffee, so definitely get some. So that’s it for this trip. Have a good weekend!!! !